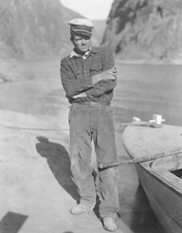 A history of Hoover Dam would not be complete without some mention of Murl Emery, the free spirited boatman of the Colorado River. He was born in the Arizona Territory on June 7, 1903 and died in Nelson, Nevada in 1981. His father could best be described as the American equivalent of a nomad. He liked to roam from place to place in search of new adventures, usually dragging the family with him. Murl seemed to inherit this trait, but as he put it "I always kept a headquarters to roam from." From the time he was a teenager running the ferry across the Colorado River between Chloride, AZ and Searchlight, NV, Murl developed a love for the outdoors, the river and exploring its natural wonders. He never strayed too far from it, and when he did he returned as soon as he could. As a boy, Murl learned to hunt and fish, and was especially fond of the beaver trappers and prospectors that frequented the hills and tributaries that bordered the river. His knowledge of the river and his uncanny ability to navigate its currents is reminiscent of Mark Twain's experience on the Mississippi. Murl's driving force was his curiosity about nature and the history of the region. His travels lead him as far up the Colorado as Lake Powell and as far down the river to Bullhead City, AZ. He even explored remote regions of the Baja in Mexico in search of ancient Indian ruins and artifacts. You might say that Murl was on the ground floor in the decision making process for the location of the Hoover Dam site. In 1921, he and a friend designed and built a boat that was especially suited for maneuvering the swift currents and shallow waters of the Colorado. The center portion of the boat had a recessed grove that housed the propeller and drive shaft. In this manner, the propeller was protected from the rocks and sandbars in the shallow areas of the river. The boat and his knowledge of the river came in handy when they were hired by Congressman Carl Hayden of Arizona. Hayden was an advocate of the reclamation craze that was sweeping through the west and especially since the Boulder Canyon Project (Hoover Dam) would provide much needed water for his state. So, the maiden voyage of the watercraft saw Murl and his companion slowly creeping upstream, starting from near where Lake Mohave is today. The little four cylinder motor struggled bravely against the strong current. They passed through Black Canyon and up to Las Vegas Wash. They stopped at nearby Hesse Camp, where Harry Stetson (of hat fame), King Gillette (razor company) and Senator Cameron (Arizona) were exploring the possibility of building a privately owned dam along this stretch of the river. The following day the intrepid crew continued up the river, through Boulder Canyon, and stopped at the government camp headed by Walker Young from the Bureau of Reclamation. The Bureau men were having trouble surveying and drilling the river bed due to the swift current at that junction. They engaged the services of Murl and his partner to ferry them to their test boats after the Hayden Trip. Hayden was waiting for them near the mouth of the Virgin River and in one day and a fast downstream current, Hayden got to view both potential dam sites. Murl did not like working for the Bureau men because of the monotony that it would entail. Instead, he agreed to work for the men at Hesse Camp as this option allowed for more "exploring." When the govenment decided that it would build the dam and acquired the surrounding land, the Hesse project was abandoned. Murl, figuring that the dam would be built in Black Canyon, set up shop at the bottom of Hemenway Wash, close to the entrance to Black Canyon. There he had plenty of work to do transporting visitors and government engineers into Black Canyon. Murl set up a little store and a primitive lodge to house visitors. Until electric power reached the construction site, and before the roads and catwalks across the river were constructed, Murl signed on with Six Companies (the private consortium that successfully bid on the government contract) to take men and supplies down the river to begin the initial drilling for the diversion tunnels. After his services were no longer needed by the contractors, Murl continued his boat service to meet the needs of tourists wanting to see the dam site and fishermen. It was during this time that he completed his second boat engineering design, the air boat. Murl mounted an aircraft engine on the back of the boat, similar to present day swamp boats, and after some tinkering, it proved to be a success. This allowed for even greater maneuverability along the river. After the dam was completed and lake Mead began to form, Murl modernized his boat facilites and secured a permit from the Park Service to run a fishing/sightseeing concession. Murl is most remembered for his efforts to help the dam workers and their families survive that first grueling hot summer. During the better part of the first year of operation, there were no living facilities for the families of the workers. Many people had heard about the Boulder Canyon Project, and were desperate for work. Single men and families squatted at the end of Hemenway wash hoping to be hired when the construction began. Some came with little more than the clothes on their backs. Conditions were harsh, and that summer was one of the hottest on record with temperature in Black Canyon reaching at times 120 degrees. The retched conditions led to the informal naming of the impromptu encampment as "Ragtown." The hardships endured by these people were of little concern to the contractors. This is where Murl stepped in and provided as much help as possible. He expanded his store operation and had trucks going into Las Vegas daily to haul in food and other supplies. These same trucks would also take those who were ill to Las Vegas for medical care. Murl extended credit to those who needed it and established a policy whereby people were allowed to pay for food at the same price that they would have paid back home. For the entire time that he served the people of Ragtown, all but two people made good on paying off their credit, with the exception of two men. Later Murl decided that these men did not pay what they owed as they likely had died at the work site. The water from the Colorado River was nearly impotable, and filled with silt. 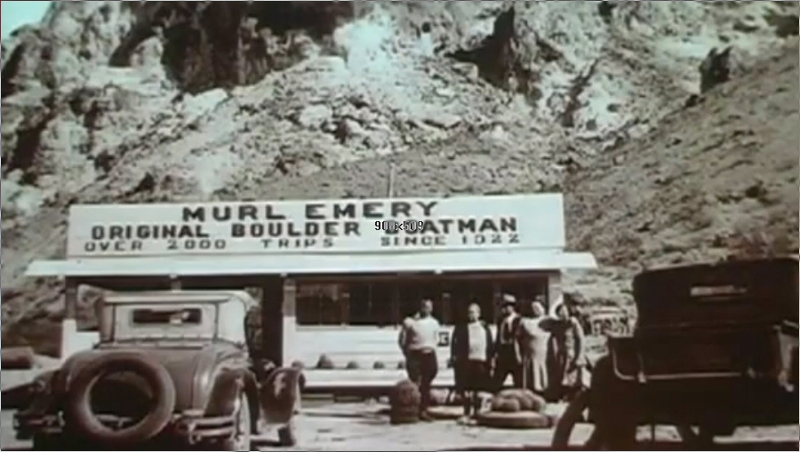 So, Murl arranged to purchase water from the railroad near Boulder City and had it hauled down to Hemenway Wash to be sold to the desperate customers virtually at cost. Murl had little good to say about the contractors of the dam as he felt that the contractors cared little for the workers' plight. He recalled one incident when his boats were urgently summoned to the work site to haul a number of "dead" men out of the diversion tunnels. As it turned out, these dead men slowly began to wake up as they returned to Ragtown. They had been victims of carbon monoxide poisoning. Gasoline powered trucks and equipment had to be used in the tunnels until electric power arrived at the dam. Murl felt that the bosses at Six Companies knew of this risk but decided to sacrifice the well-being of the workers to meet construction goals. After his dispute with the Park Service over the concession permit, Murl located permanently to Nelson, NV, downstream from the dam. There he continued his fishing business. He also continued his lifelong exploration and prospecting of the Colorado River region and Baja, California. Murl Emery, by R.C. Tanner, Interviewer, Hoover Dam oral history project.